Festschrift for Hannes Tretter and Manfred Nowak. Vienna: Neuer Wissenschaftlicher Verlag, 2019. 871 p.
Hannes Tretter and Manfred Nowak, together with Felix Ermacora, founded the Ludwig Boltzmann Institute of Human Rights in 1992 and acted as directors of the Institute for more than 27 years. The upcoming change in the scientific management of the institute was the reason for the preparation of the present Festschrift. The editors designed and coordinated a very special book, a commemorative publication for two human rights professors, which are united by a life's work. Two human rights scholars who always raised their voices for human rights and never compromised. Two important pillars of the Austrian human rights scene, who established the BIM as Austria’s leading human rights institute. The publication brings together contributions from academia, civil society, politics and business. The topics covered are as broad as the types of texts: academic contributions, interviews, conversations, stories about the BIM, anecdotes, memories, speeches, even a drama and photomontages. 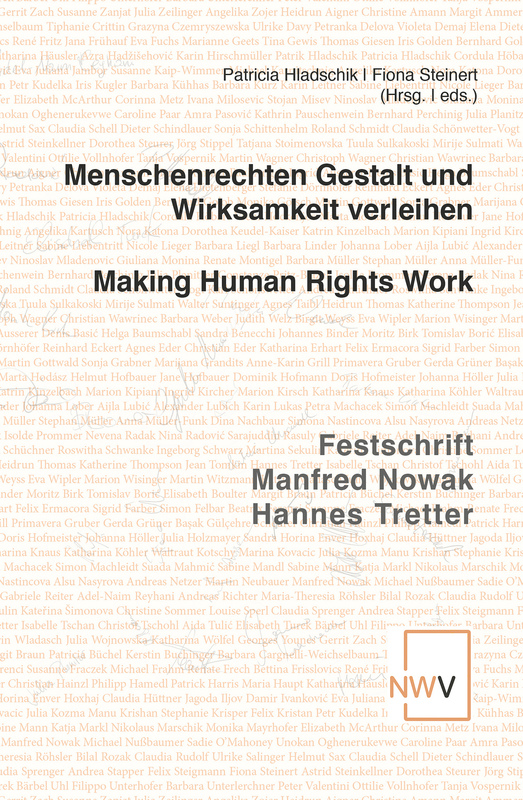 A publication that brings together the large network of Hannes Tretter and Manfred Nowak, a large network of people working for and with human rights all over the world. The volume brings together 109 authors who comment on current human rights challenges in 71 articles. Many contributions have been co-written by two authors as a reference to Nowak and Tretter in tandem. The texts are written in German or English. The many international contributions impressively show the recognition that Hannes Tretter and Manfred Nowak have received worldwide, and they also show that they have managed to set up Austria's largest human rights institute broadly and to position it as an important national and international actor.